German Protestant Hebraist and historian of Israel; born in Arnstadt May 11, 1848. He became privat-docent in the University of Leipsic in 1873, and professor of theology at Giessen in 1875. Of Stade's works the following may be mentioned:"De Isaiæ Vaticiniis Æthiopicis Diatribe" (Leipsic, 1873); "Ueber die Alttestamentliche Vorstellung vom Zustand nach dem Tod" (ib. 1877); "Lehrbuch der Hebräischen Grammatik" (part i., ib. 1879), an attempt at harmonizing the philological methods of Olshausen and Ewald; "Geschichte des Volkes Israel" (vol. i., Berlin, 1881-84; 2d ed. 1885; vol. ii., in collaboration with O. Holtzmann, ib. 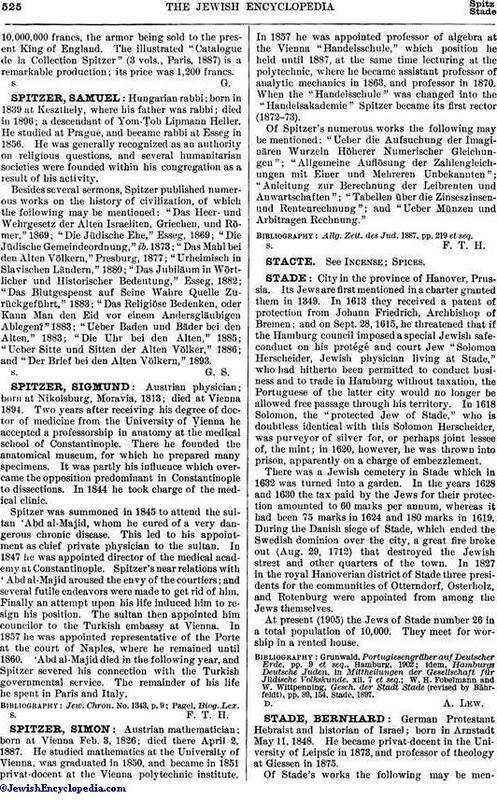 1888), a critical reconstruction of the history of Israel in accord with Graf and Wellhausen; "Hebräisches Wörterbuch zum Alten Testament" (in collaboration with Siegfried, Leipsic, 1893); "Ausgewählte Akademische Reden und Abhandlungen" (Giessen, 1899). In conjunction with F. Schwally, Stade edited a revised Hebrew text of the Book of Kings (Leipsic, 1904), for Haupt's "Sacred Books of the Old Testament." 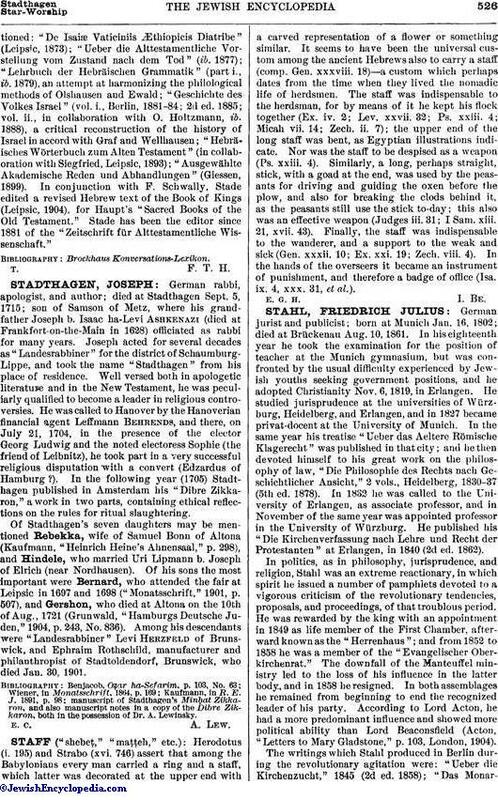 Stade has been the editor since 1881 of the "Zeitschrift für Alttestamentliche Wissenschaft."